It means waking up bright and early, grabbing a friend, and volunteering in a space that needs your help. It’s offering a smile to the older woman going outside for a walk, investing in your local businesses, and trying to really understand what skills you already have and how you can use them to advocate. On October 22, a group of more than 40 people did just that. Every year, Kiwanis, an international club with members in more than 80 nations, holds a day of service titled “One Day.” This year, Kiwanis Division 26 hosted their One Day at Centro Campesino. 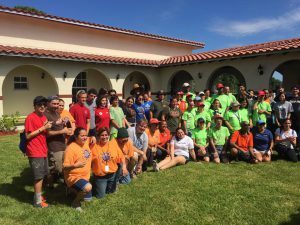 Joined by the Key Club and the WOW Center of Miami, Kiwanis beautified both Centro Campesino’s main space and the home that we own next door. The volunteers painted benches, created basketball lines on our court, built bookshelves, and prepared the new addition to our building for our YouthPride children. The clear, blue sky and rare cool Florida breeze wasn’t the most beautiful thing that morning, but rather the different groups of people who came together and worked towards a common goal. We are extremely thankful for the organizers of this event, for the work that they did, and inspiring us to continue giving back to our community.